They covered our readings of the Adventure Collection at the Book Cellar in Nashua NH. Interviewed Sam (Lucas) about the event. Several news outlets posted similar coverage of the upcoming event. NHTI Fall Jam on the Concord Monitor's website as the top story. We are also the lead article in the 11\16\15 paper. 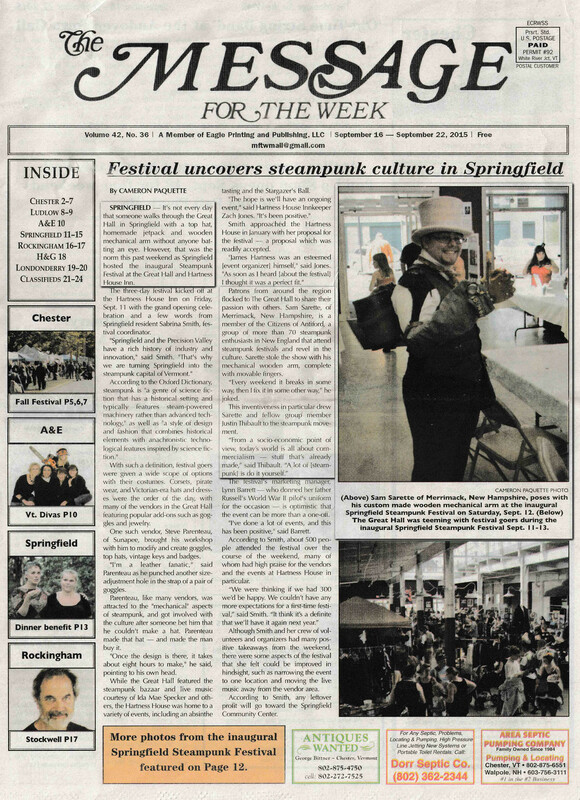 A reporter interviewed the order during our visit to the Springfield Vermont Steampunk Festival. "Citizens of Fantiford" → "Citizens of Antiford"
They interviewed both Lucas and Phin. Lucas and the Mainers ( Caelum Navis ) were interviewed for Waltham's festival. Full article interviewing Phin and Abigail is available for subscribers of the Nashua Telegraph.